View from the Window at Le Gras - magical! 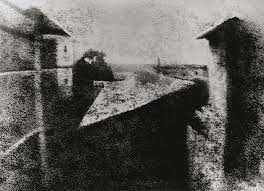 "It took a unique combination of ingenuity and curiosity to produce the first known photograph, so it’s fitting that the man who made it was an inventor and not an artist. In the 1820s, Joseph Nicéphore Niépce had become fascinated with the printing method of lithography, in which images drawn on stone could be reproduced using oil-based ink. Searching for other ways to produce images, Niépce set up a device called a camera obscura, which captured and projected scenes illuminated by sunlight, and trained it on the view outside his studio window in eastern France. The scene was cast on a treated pewter plate that, after many hours, retained a crude copy of the buildings and rooftops outside. The result was the first known permanent photograph. It is no overstatement to say that Niépce’s achievement laid the groundwork for the development of photography. Later, he worked with artist Louis Daguerre, whose sharper daguerreotype images marked photography’s next major advancement."